The leader of the Liberation Tigers of Tamil Eelam, Mr. V. Pirapaharan, Saturday honored 77 year old Mr. Ira. Nagalingam from Germany for his contribution to Tamil language and cultural education among children in the Tamil diaspora in Germany. 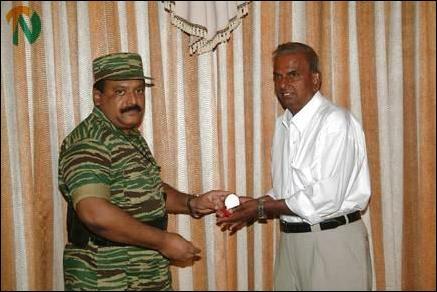 Mr. Nagalingam received an award embossed with the Tiger emblem from the LTTE leader. The director of Tamil Eelam Education Board, Mr. V. Ilankumaran, LTTE's Political Head, Mr. S. P. Thamilchelvan and the Head of LTTE's International Affairs Secretariat, Mr. V. Manivannan, participated in the event. Mr. Nagalingam established a Tamil education facility on his own initiative in the city of Hagen in Germany back in 1986 with 10 pupils. Later, the efforts in German diaspora resulted in 13 different education facilities across Germany as early as 1989. Mr. Nagalingam organised the first ever common examinations for the Tamil education facilities in Germany in 1989. The same year Mr. Nagalingam was appointed as the head of Tamil language services for Germany by the LTTE's German branch. Since 1990, Mr. Nagalingam has contributed to coordinating different Tamil language and cultural education facilities and merging them into Thamilalayam (Tamil Temple) schools and has worked hard to establish coordinated Tamil education across Germany and Europe among the Tamil diaspora. There are 123 Thamilalayam education centres across Germany today with 6000 pupils and 650 teachers. There are around 350 staff administrating the schools. Mr. Nagalingam hails from Vasavilan, Valigamam in Jaffna and is a trained teacher from Kolumbuthruai Teachers Training School. He taught in Matale, Peradeniya, Hatton and finally in Urumpirai before emigrating to Germany in 1979. Mr. Nagalingam is a Drama artist having staged many dramas in Sri Lanka. He was selected as best drama actor in a contest among teachers' training colleges. He has earlier been honoured with the titles "Father of Thamilalayams" and "Savior of Tamil language" in Germany.